How to make a bow out of ribbon? You should need a bow if you are wrapping a gift and trying to make it look pretty. Women love to wear it on their hair as well. Below are the steps to build a perfect bow and if are going to put it on your hair, you should just have to use a glue gun to attach a clip at the back. you Here is how you can make a bow out of a ribbon. How to make a bow? Step 2: Since the loop is a circle, straighten it out by pressing it and making it a 3 inches’ (7.5 cm) straight line. Fold it and press through the center and it should look somewhat like a bow by now. Use a needle and a thread of the same color to sew it. It should make the center of your bow tight. Step 3: Pull the extra thread and wrap it around the middle part of the bow so that you can secure it. It should look like a complete bow with just one problem. That is the thread in the middle should not be seen. Cut out a one and a half inches of ribbon and make it a rectangle. You do not need to use a needle here. Use the glue gun. Step 4: First of all, use a lighter on that place and secondly use glue gun. Do not use your hands since it is going to be hot. Use a hard object to press down the ribbon on the glue. The bottom part is not going to look pretty if they are two straight lines hanging. A ribbon has the bottom part cut diagonally. Use scissors to cut them to your desired shape. • You can use different types of ribbon to make a bow as an experiment and see which one works better for you. 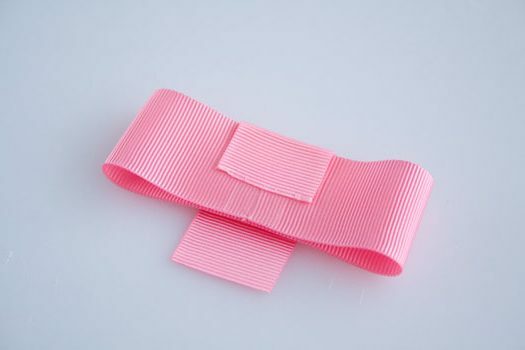 You should decide the reason for buying the ribbon whether it is for wrapping a gift or for someone’s hair. • If you get the measurements correctly, making a bow should be an easy task for you. • Be careful using the lighter if you are not familiar with using it.